Summary: Welcome to Caraval, where nothing is quite what it seems. Everyone (including like your stepmum’s nephews dog) is talking about this book. As Stephanie Garber’s debut novel, a huge hype has surrounded Caraval since last summer when the ARC’s were being handed out to the lucky chosen ones. I tried to get my hands on an ARC at YALC last year, and after being unsuccessful, had to resort to reading it when it was released. But, boy was it worth the wait. 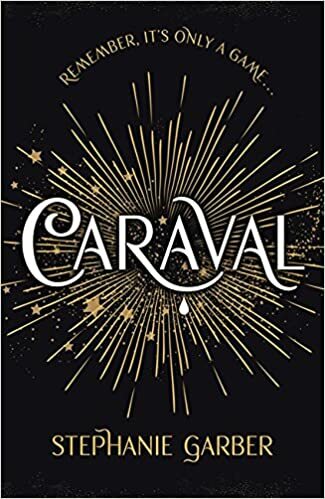 Caraval is somewhat of a YA The Night Cirus, with some little twists and tricks that make it incredibly unique, exciting, gripping and anything else you want to throw in there. I went in to the story unknowing of anything except for the games themed plot, and i’d advise anyone to do the same. I adored learning about the world, characters, magic and games as i went along, it made it a lot more interesting and kept you waiting to see what would happen next. The strongest point of this is by far the twists and turns within the plot. I struggled to believe whilst reading that this is Garber’s first novel. These complex story-lines are apparent in the most well known authors works, and the kind of suspense it leaves you with is the equivalent of a Stephen King story. Surprise is what Garber is good at, i’m more than impressed with how exciting she made this story. I literally did not know what was real and what was not whilst reading, this was done in the best way possible and didn’t leave you confused. Garber also created wonderfully insightful and interesting characters that managed to steer away from the YA ‘norms’ that so many books are inhabited with these days. The characters are complex and detailed in their descriptions, and it’s the first book i’ve read in a long time in which i can remember who was who and who did what in the story. She made each and every character stand out, somewhat like Suzanne Collins did in The Hunger Games trilogy. I fell completely in love with Julian and Scarlett, they were rich with personality and that’s what you want from a good, gripping novel. I don’t have a bad word to say about this story. It’s daring and unique without being too ‘out there’. There’s a wonderful sense of magic that made the story that little bit more magical also. I cannot praise it enough and it most definitely deserves all the hype around it at the moment. If you want a book that you’ll get completely lost in for a few days, and won’t forget for some time after, this is definitely the one for you.